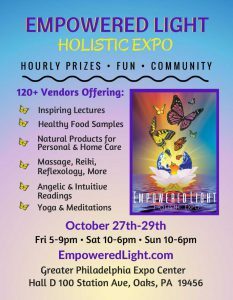 OAKS — Take a step toward a healthier, more fulfilling lifestyle at the Empowered Light Holistic Expo! The expo’s focus is on holistic lifestyles, spiritual classes and personal development. The expo runs from 5 to 9 p.m., Friday, 27 October, and from 10 a.m. to 6 p.m., 28 and 29 October, at the Greater Philadelphia Expo Center, 100 Station Avenue, Oaks. General Admission tickets range from $7.50 to $27. Most workshops and lectures are included with general admission, with advance sale discounted tickets for the Featured Speakers. There’s plenty of free parking available. Empowered Light seeks to engage the attendees through experiential types of classes, like yoga, meditation, sound healing, or mini treatments like reiki and massage. Attendees can choose from over 50 workshops and lectures over the course of the weekend. Lectures and workshops have the goal of enlightening and empowering, as well as encouraging participation. Renowned Gaia TV host and Intuitive Corey Good is a featured speaker, as is author John Van Auken, Director of the Edgar Cayce Foundation. Professor Semir “Dr. Sam” Osmanagich, who discovered the Bosnian Pyramids, will be presenting, as will Ataana, Energy healer from Nashville. Other scheduled speakers include psychic mediums, published authors, and experts on a variety of health related and spiritual development topics, like healthy food and developing your intuition. Guests will be able to linger and shop in between workshops and talks with more than 150 Holistic Vendors. For more information, call 484-459-3082, email EmpoweredLightexpo@gmail.com or visit EmpoweredLight.com. Editor’s Note: This was a press release written and supplied by Empowered Light Expo.